The Early Seekers Team sent us the following update today…they are still working hard and still going strong!!!! Once again we had another blessed morning at KP, we had the honor of having Genera, William Leonard and several others helping on the food truck at KP this morning. God bless you all. Once again there was a huge amount of people At KP This morning. We passed out 362 lunches,9 bags of clothing, toiletries & bibles Everyone was so thankful. God bless you all for your labor of love in all you do to bless this ministry and for all your Prayers. Please see the Praise Reports below. A grateful thank you to all who make sandwiches, Lunches, give snacks and drinks. God bless you all. Note: If you are making sandwiches, Lunches, or donating Snacks, Lunches, coffee or any food items to the Early Seekers, would you kindly please go to the sign up sheet located on the side of the cabinet in the Church kitchen and Write down what you brought in and how many Lunches ,sandwiches, items etc and sign your name so we can keep an accurate account. Thank you so much. Also Please label your donations Early Seekers. God bless you all. A grateful Thank you to Sharon Cogean’s Co- workers for the clothing and toiletries. And to all who donated clothing. and Thank you Sharon for picking them up and delivering them. You all are such a blessing to the Homeless. God bless all of you. Lidia said the sinners prayer with a man and the angels in heaven are rejoicing with us as there is a new name written down in Glory. and His name is John Praise God!!! Liz Brenda Melucci’s mom is swallowing and eating normally!!!! Liz and the family thank you so very much for all your prayers. Tom a Man we have not seen for a few years and use to come to Pt faithfully with his wife. came to Jan and said O my God I can’t believe you all are still coming to KP , giving out food and clothing after all these years. 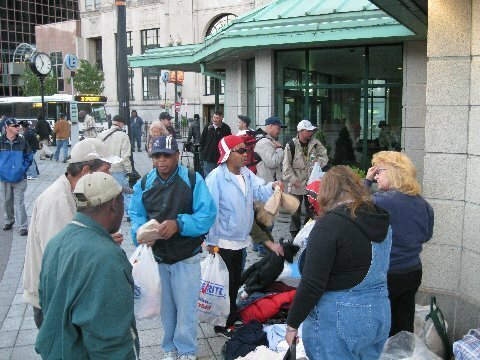 I know a lot of organizations That help the homeless but they come and go and fade out. You have been doing this faithfully for years. You are so dedicated. this shows that your love is real and genuine. He & his wife are living in East Providence and have been attending a church near him. But also said he wants to come to PT again. Robert needs a miracle healing from addiction that has tried to kill him, He also needs a miracle healing for his liver he is only in his 20’s Please, Please storm heaven for him and his family. His mom and sister are Born Again.Pray for His salvation as well. Paulie & his family please continue to pray for all his loved ones that are battling Cancer and other illness as well and pray for his family as well as they are caring for them. Barbara & Bob They need many miracles in their family, they really need a break through. Cheryl God knows, And some man is constantly bothering her . Ronnie will be out of jail soon please keep him and his wife and children in prayer.He is now Born again and doing well. Jimmy needs jeans size 32 or 34 He needs a home sleeps out side, He wants to come to church with his girl, He wants to get out of his situation and was in tears we prayed for him also. Tony asks for prayer for Philip C.
Job Peace& good health Needs BP. A man said Pray for Spring !!!!!!! Thank you so much for all your support!!!! Check out this email I received from the Early Seekers Team – it came with a throwback pic! What an awesome morning we had at Kennedy Plaza!!! We passed out about 30 huge bags of clothing, several bags of toiletries, About 10 blankets, a radio and a coffee maker and about 300 sandwiches. Praise God! and a Heartfelt thank you to all of you, once again YOU MAKE THIS HAPPEN!!!!!! Over 300 people were blessed by you today, They were all so thankful and walked away with smiles on their faces because of your love and faithfulness to them. God bless You all. Joe Brito Sharon Cogean’s Co-Worker who donated 3 huge bags of designer clothing, Some Brand new Jeans, Men’s underwear & many T shirts and other slightly used clothing. What a huge blessing to the men these are the items that are so hard to come by. They always ask for Jeans & underwear, They were so excited to get them. You made their day. God bless you. Andrea from Help the homeless in Rhode Island for the 6 huge bags of clothing, and plastic lunch bags. They were so blessed by you. God Bless you. Sharon Cogean’s coworkers for the toiletries and clothing, Your continued support is such a blessing to them. God bless you all. Steve Marocco for all the Huge Boxes of Brand New Jackets and clothing. Your continued support is such a blessing to them. God bless you. 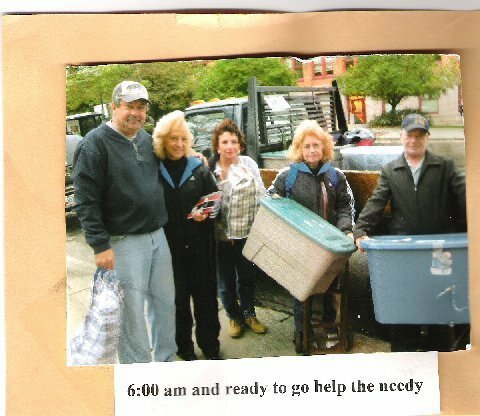 Linda Cantone for the things you donated.God bless you. Marie Tatarian & Lynn Spirito’s Family & to their friends from facebook: Lorie Ricci, Karen Stahowick Ramsdem, Sheila Maguire and to all who donate Lunches each week. God bless you all. Liz, Brenda Melucci’s Mother, had her surgery and it went well and she is able to talk well and may be able to swallow soon. Mr. & Mrs. Santiago: Got their apartment a few weeks ago and they keep getting blessed and are so thankful. Coreen & Barbara From Help the Homeless in Rhode Island went to their apartment last week and blessed them with a brand New Pan Set, blankets Pillow’s & toiletries. Mr. Santiago was at KP this week and was telling us how thankful, Him and his wife are. They are also bring them a toaster, silverware and a coat. God bless them. Lewis is 3 years sober and has been working and doing well Praise God! Liz Brenda’s Mother please continue to keep her in prayer for complete Healing. Thanks Love and prayers from the Homeless & the Early Seekers!! !